CSOs may succeed in pushing for increases in budgetary allocations for the MDGs, but this does not mean that these budget items are being released or are actually reaching the grassroots. Successfully lobbying for increases on the budget for social development is just the first step. The next crucial step is CITIZENS’ BUDGET MONITORING to ensure that that budgets are actually released and properly implemented. Citizens should include all phases of the budget process – preparation, legislation, implementation and accountability. The Citizens’ MDG Budget Monitoring Tools developed by Social Watch Philippines in partnership with the local government units and citizens groups in Dauin, La Libertad and Sibulan in Negros Oriental serves as practical guide for LGUs & NGOs for budget analysis and monitoring. It ensures adequate financing to achieve the MDGs and support advocacy initiatives of local stakeholders. 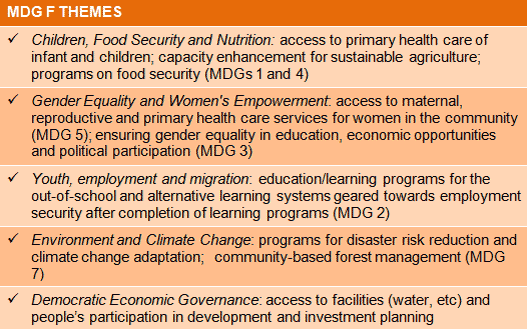 The United Nations MDG Achievement Fund (MDG-F) funded the Toolkit development and implementation. The Citizens’ MDG Budget Monitoring Tools build the capacity of community stakeholders on monitoring the budget for the MDGs at the local level towards measuring impacts of the programs and budget for MDGs. It helps determine areas of socioeconomic services that need more focus and funding so that the MDGs would truly work for the improvement of the quality of life at the grassroots. The UN MDG-F themes provided direction in determining priorities in terms of programs and budgets to be closely monitored so that MDGs actually work in ending poverty at the community level and ensuring that no marginalized sector will be left behind in the MDGs.